SANTS celebrated the graduation of 450 Newly Qualified Teachers during the month of November. These graduates completed the Diploma in Grade R Teaching, Bachelor of Education in Foundation and Intermediate Phase Teaching programmes. It must be noted that the majority of graduates, completed the Diploma in Grade R Teaching programme. The government has begun to address the quality of teachers and Initial Teacher Education programmes by implementing the policy on The Minimum Requirements for Teacher Education Qualifications (MRTEQ), revised in 2015. The Eastern Cape Department of Education, Gauteng Department of Education and Matthew Goniwe School of Leadership and Governance have invested resources in the form of bursaries to in-service practitioners the past few years. These initiatives, among others, is to ensure adequately qualified teachers in their provinces, which directly address and elevate the quality of teaching and learning in classrooms. 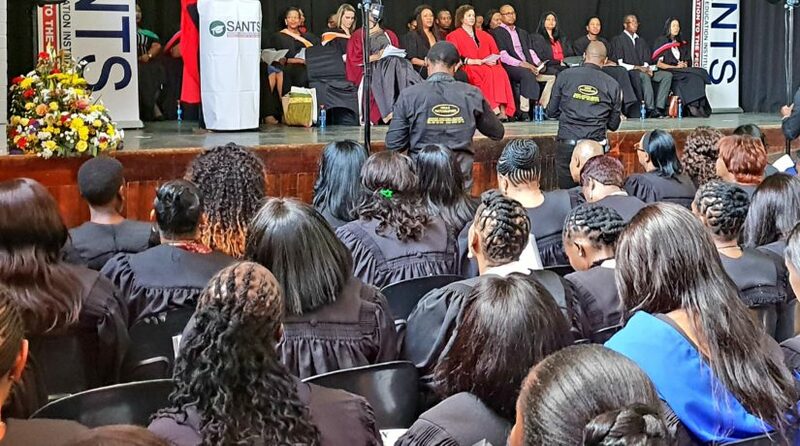 Professor Ina Joubert, SANTS’ Executive Academic Director, encouraged graduates to identify opportunities in their classroom and communities to touch the lives of many children and their families as a qualified teacher that you now are. Share your specialized knowledge and skills, your creativity and your passion for young children and their future. Kindle your inquisitive spirit in becoming the lifelong learner, sharing, inspiring and making a difference. The Department of Higher Education and Training (DHET) approved and recognises these qualifications for employment purposes in education. Furthermore, these qualifications have been registered with the South African Qualification Authority (SAQA). Graduands will be qualified and recognised teachers who will be able to teach Grade R learners, Foundation Phase (Grade R to Grade 3), Intermediate Phase (Grade 4 to Grade 6) in formal schooling, respectively. This directly addresses the national shortage of qualified teachers. With this student drawn from predominantly demographically marginalised communities of South Africa, these qualifications address the skills, access, equity, the quality of teaching and learning on a national level, especially in early childhood education.